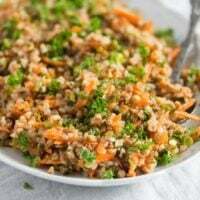 Vegan roasted buckwheat salad recipe with carrots, scallions and a sweet and lemony dressing. a couple of months ago and, surprisingly, I have used it all up in such a short time. OK, there is still about ½ cup roasted buckwheat in the bag, but I am already planning another vegan buckwheat recipe – a soup – for the weekend. When making a soup I don’t need that much of it. 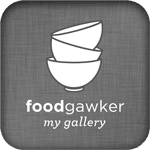 Usually, I buy a bag of something similar (bulgur, couscous, spelt berries, amaranth, lentils, beans) and although I try to use it all up before it expires, it usually does not happens so fast. This time it did happen. But not to worry, buckwheat is a super healthy gluten free plant, so it really doesn’t matter if you have it often. You can buy buckwheat either roasted or unroasted. Sometimes the issue is specified on the packet of buckwheat, but unfortunately not always. Most recipes I cooked with buckwheat ask for roasted buckwheat. And luckily most buckwheat that you can buy in a regular store is already roasted and usually the packet will only mention anything if the buckwheat is raw, so unroasted. The best and easiest way to tell if the buckwheat is roasted or not is by looking at it: raw buckwheat has a very light color, while roasted buckwheat is brown and crunchier if you bite it… That easy! 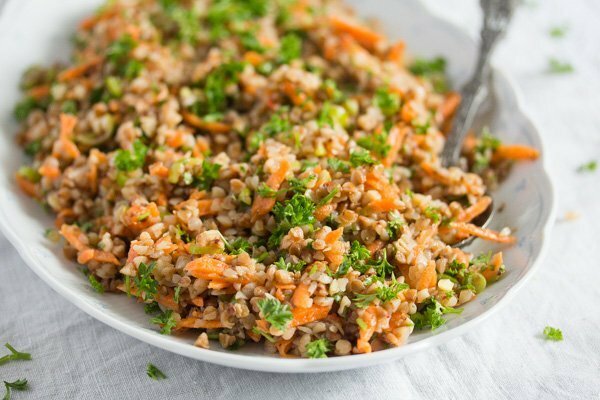 This vegan buckwheat recipe is super simple. The only thing you have to pay attention to is to cook your buckwheat the right way. Cook it right and the buckwheat groats will be soft while still retaining a bite, nutty and delicious! Cook it too long or use too much liquid (water, stock) and the buckwheat will be too soft, mushy and watery. You will not like it. The most important thing when cooking buckwheat groats is not to use to much liquid or to overcook the groats. In both cases you will end up with mushy buckwheat, which is not particularly nice to eat. Make sure you read the package’s instructions before starting to cook the buckwheat groats. Most packages would instruct you to use a 1 to 2 ratio of buckwheat groats and water, so 1 cup buckwheat to 2 cups water. However, I always use less water or broth to cook buckwheat, so 1 cup buckwheat to 1 ¾ cup water. I make sure that the lid of the pan fits well, so that not too much steam can escape. How long should you cook buckwheat? Definitely check the packet’s instructions, they can differ so much, from 7-8 minutes on some to 15-18 minutes on others. So, make absolutely sure to check the packet’s instructions before you start cooking the buckwheat, no matter what the recipe you are following is instructing you to do. IMPORTANT: Never trust only a recipe when cooking buckwheat. ALWAYS read the packet’s instructions regarding the ratio of buckwheat to water and the cooking times. Use slightly less water than recommended on the packet’s instructions, while making sure that the pot you are using has a tight fitting lid and start checking if the buckwheat has reached the desired consistency about 2-3 minutes before the recommended time is up. Step 1: Bring the vegetable broth to a boil. Rinse the buckwheat groats in a sieve and give them to the pot. Cover with a tight fitting lid and simmer on low heat, more or less 10 minutes. Check the packet’s instructions and start checking if the buckwheat is cooked to your liking 2-3 minutes before the recommended time is up. If there is still some liquid left in the pan by the time the buckwheat is cooked, drain it well (in the sieve). Let the buckwheat cool. 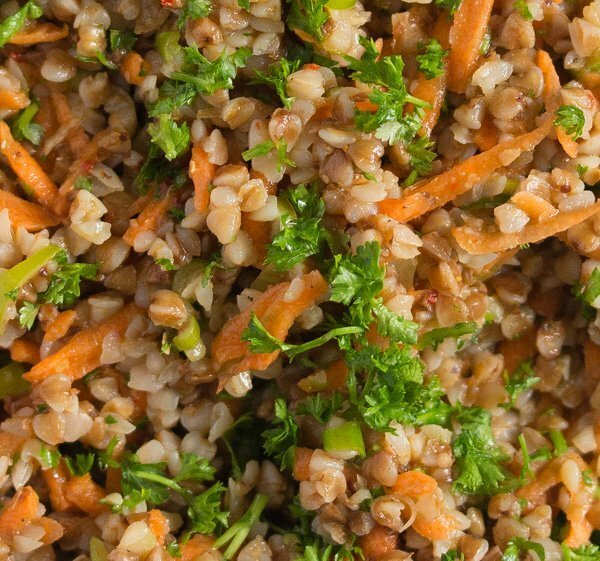 You can serve this buckwheat salad either lukewarm or cold. Step 2: Make the dressing. Finely grate the garlic cloves. Mix with the olive oil, brown sugar and ¾ of the lemon juice first. Add the spices: chili flakes, ground cumin, ground coriander salt and pepper. Stir well until the sugar dissolves. Adjust the taste with the remaining lemon juice, salt and more sugar, if necessary. The dressing should be really lemony, yet sweet, strong flavors are required, so don’t be shy with the lemon juice and the sugar.
. Thinly slice the scallions/green onions. Chop the parsley including most of their stems. Remove only the thicker lower parts of the stems, about 1-2 cm/ 0.4-0.8 inches. Give everything to the bowl containing the roasted buckwheat. Step 4: Give the dressing to the buckwheat salad and mix well. Taste and adjust the taste again, if necessary. As mentioned above, the dressing should be really powerful and give the salad a real kick. 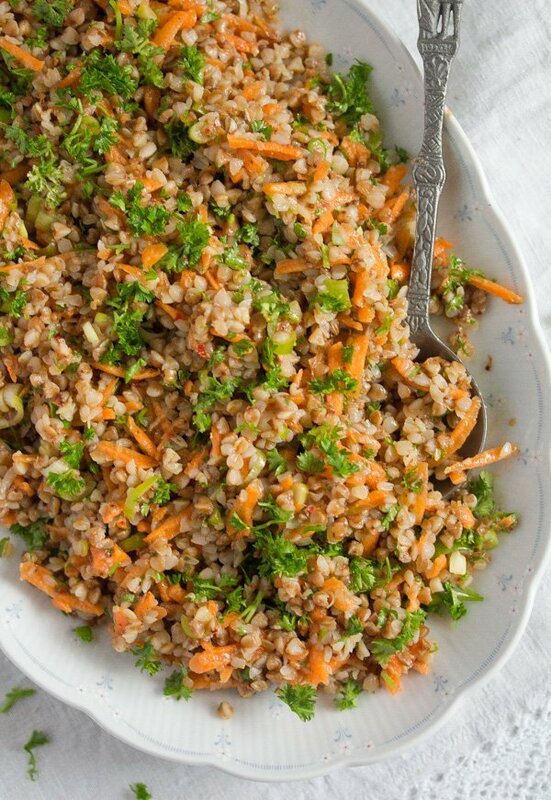 This roasted buckwheat salad can be served lukewarm or completely cooled. You can cook the buckwheat groats in advance, let them cool and keep them in an airtight container in the refrigerator until ready to use. To make a complete meal, you could serve some creamy vegetable soup before or with the buckwheat salad. 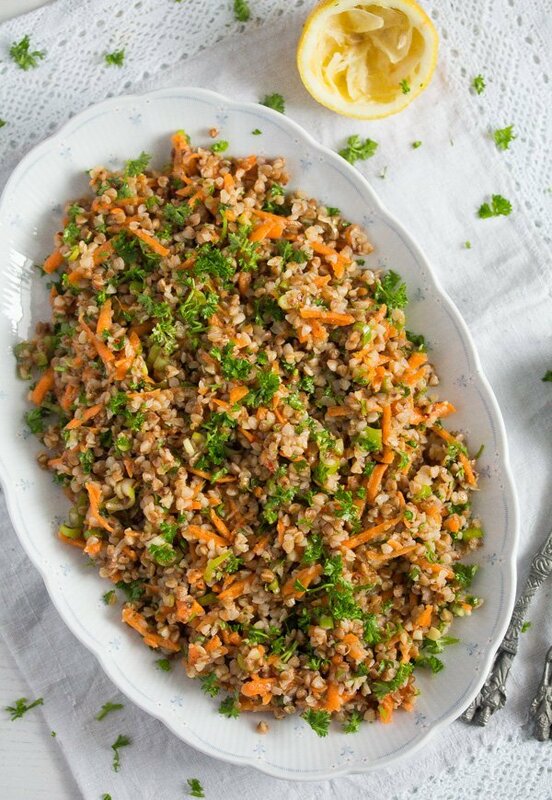 The buckwheat salad is a suitable dish to bring to a barbecue or a party and it makes a great side dish for meats, chicken or fish. I can imagine eating it alongside this slowed cooked shoulder of lamb, for instance. The buckwheat salad with lemon dressing keeps very well. You can keep it in an airtight container in the fridge for several day. 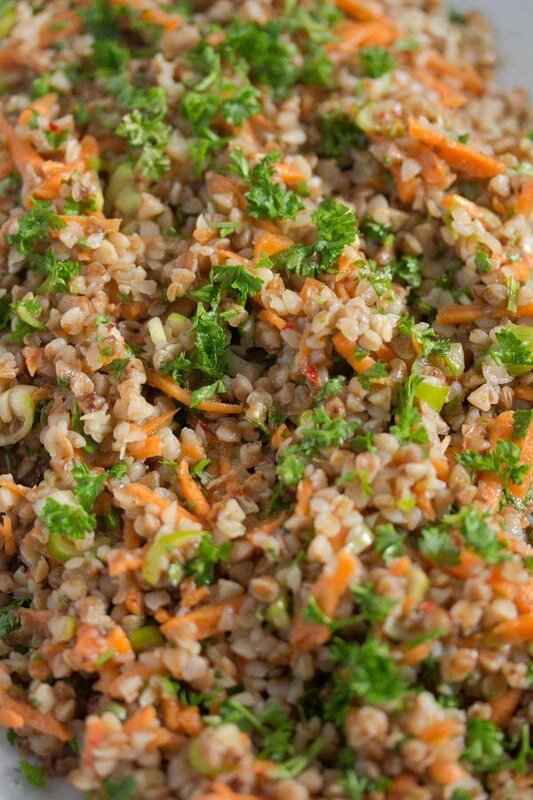 This vegan buckwheat recipe also makes a great lunch box food, easy to transport and to eat at work. Bring the vegetable broth to a boil. Add the rinsed buckwheat groats, cover the saucepan with a tight fitting lid and simmer on low heat until the buckwheat is done to your liking, more or less 10 minutes. Check the buckwheat's package instructions regarding the cooking times, they can differ from pack to pack and sometimes a lot. Check the buckwheat 2-3 minutes earlier than indicated on the package, just to make sure you don't overcooked it. It should be soft, but still have a good bite. Mushy buckwheat is not good. Drain the buckwheat well, if there is still liquid left in the pan. Give the buckwheat to a large bowl and leave to cool. To make the dressing finely grate the garlic cloves and give them to a small bowl. Add the olive oil, brown sugar, about ¾ of the freshly squeezed lemon juice, chili flakes, ground cumin, ground coriander, some salt and pepper. Stir well. Adjust the taste with more sugar, lemon juice and salt, if necessary. The dressing should taste sweet and very lemony, the flavors should be strong. Grate the carrots on the large holes of a grater box. Cut the scallions into fine rings. Chop the parsley, including most of the stems (only discard the lower thicker parts of the stems). 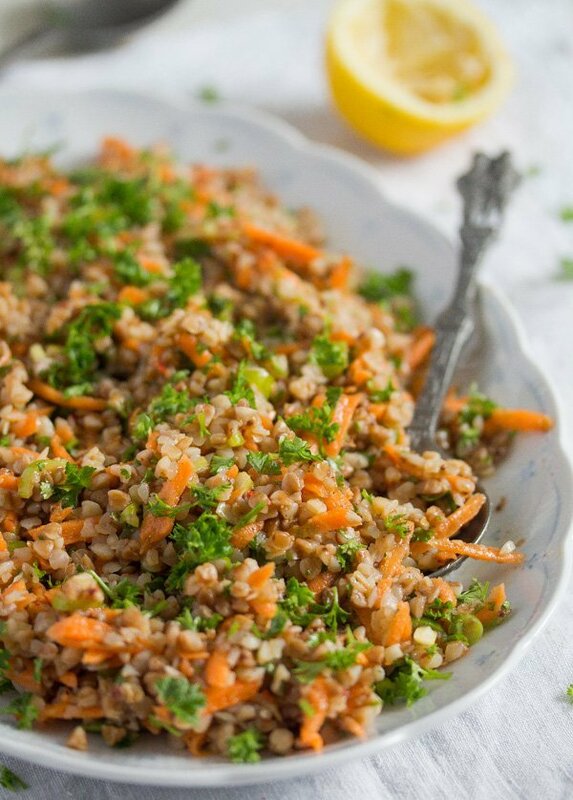 Give the vegetables and the parsley to the buckwheat bowl. Pour the dressing over the salad and stir well. Adjust the taste again. Serve immediately or refrigerate until serving. Simple yet so good! The dressing would be wonderful for other whole grains too. Very interesting. I’m intrigued by the lemon and the sugar in the dressing. Love the carrots.